Gross motor activity is very important in to have in classrooms. Children can jump, run, skip, lunge, gallop, anything that will help with large motor coordination. You can play games, work with a parachute, or crab walk. You may want to have a gross motor "center" area for your classroom. Large plastic hoops, music player, soft balls of various sizes, building blocks, bowling set, cars, jump ropes, cones, balance beam, masking tape for lines. Remember you will have to have rules for this area, and will need to model how to use these items. 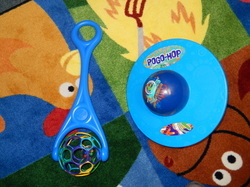 Pogo ball (so much fun) and a pushing/pulling roller! 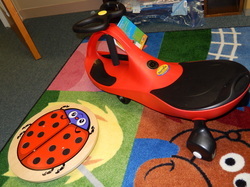 A large seated roller, and a standing balance toy. 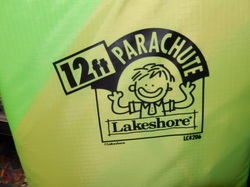 Who remembers playing with a parachute? That was the most fun day in P.E! I loved the parachute, they are inexpensive, and can even be made if you or a parent in your room can sew!